Chemical Reviews, 2017, 117, 13461–13501. First published online 19 October 2017. Readily available cyclodextrins (CDs) with an inherent hydrophobic internal cavity and hydrophilic external surface are macrocyclic entities that display a combination of molecular recognition and complexation properties with vital implications for host–guest supramolecular chemistry. While the host–guest chemistry of CDs has been widely recognized and led to their exploitation in a variety of important functions over the last five decades, these naturally occurring macrocyclic systems have emerged only recently as promising macrocyclic molecules to fabricate environmentally benign functional nanomaterials. 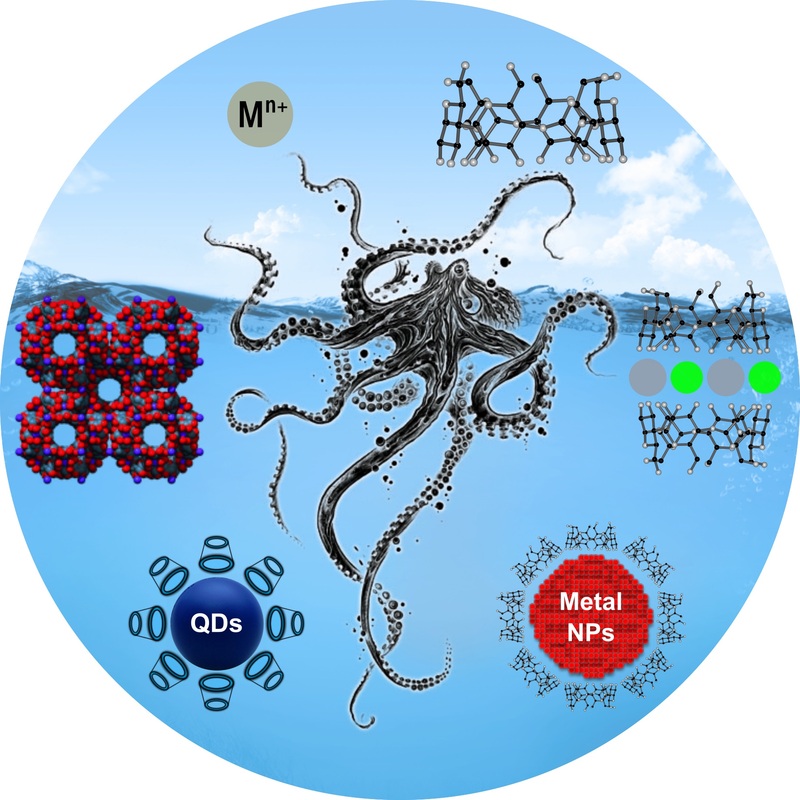 This review surveys the development in the field paying special attention to the synthesis and emerging uses of various unmodified CD–metal complexes and CD–inorganic nanoparticle systems and identifies possible future directions. The association of a hydrophobic cavity of CDs with metal ions or various inorganic nanoparticles is a very appealing strategy for controlling the inorganic subunits properties in the very competitive water environment. In this review we provide the most prominent examples of unmodified CDs’ inclusion complexes with organometallic guests and update the research in this field from the past decade. We discuss also the coordination flexibility of native CDs to metal ions in CD-based metal complexes and summarize the progress in the synthesis and characterization of CD–metal complexes and their use in catalysis and sensing as well as construction of molecular magnets. Then we provide a comprehensive overview of emerging applications of native CDs in materials science and nanotechnology. Remarkably, in the past few years CDs have appeared as attractive building units for the synthesis of carbohydrate metal–organic frameworks (CD–MOFs) in a combination of alkali-metal cations. The preparation of this new class of highly porous materials and their applications in the separation of small molecules, the loading of drug molecules, as well as efficient host templates in the construction of nanomaterials with the desired functionality, including the first-in-class devices including sensors and memristors, are highlighted. Finally, CDs as well-known “green” molecular hosts have also been used as ideal functional molecules to improve the solubility, stability, and bioavailability of inorganic nanoparticles. In this regard, we demonstrate various strategies for the preparation of native CDs-modified inorganic nanomaterials such as metal, metal oxide, and semiconductor and magnetic nanoparticles, aiming to take advantage of both the controlled properties of the inorganic core and the controlled properties of the coating molecules. The functionalization of a CD hydrophobic cavity with an inorganic nanoparticle is very prospective for the development of novel catalytic systems and new tools for highly selective and sensitive sensing platforms for various targets.